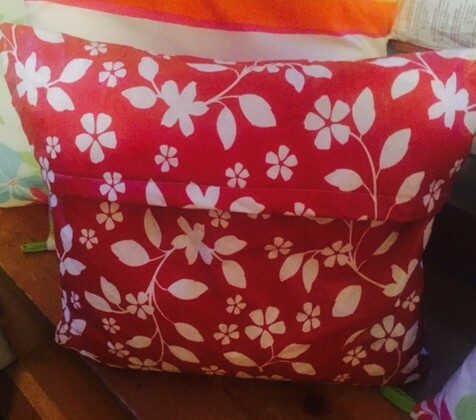 This cute little pillow is made from a flannel backed tablecloth, the type you can buy at any Dollarama or Walmart. This is easy and very inexpensive to make. The weather here in my part of the country tends to change if you turn around or blink your eyes …lol so I came up with this idea as I wanted a pillow that was economical and one that I could leave outdoors and not worry to much about ruining it if it got wet. I decided to give one of these away on my Facebook page and promised to put the tutorial on this blog. Measure the dimensions of the pillow insert. To determine the size rectangle you’ll need, add 1 inch to the height for seam allowance, and multiply the length by 2, then add 6 inches. 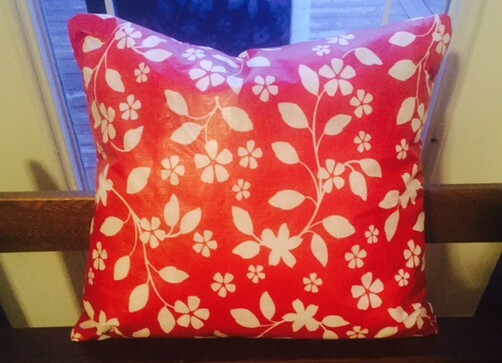 The pillow in the pictures is 16 inches x 16 inches so I used the dimensions 17-by-40-inches. With the pen and a ruler, draw the dimensions of the rectangle on your tablecloth; cut it out. Place the rectangle right-side down. Double-hem the left and right edges: Fold each edge in 1/2 inch, press( use a low setting on your iron and make sure you use a towel in between the vinyl tablecloth and the iron , otherwise your tablecloth will melt…., )then fold over again 1/2 inch and press. Pin and edge-stitch 1/8 inch from the inner fold. Fold the left and right edges in, overlapping them by 4 inches. Measure the square to make sure it matches the pillow insert’s dimensions. See above diagram. Pin the top and bottom edges; sew them with a 1/2-inch seam allowance. Turn the cover right-side out. Use a pencil or pen to push the corners out. To make my pillow even more “weather” friendly I stuffed it with plastic grocery bags – if you decide to do it this way, you will need approximately 60 bags to make it as fluffy as a fiberfill pillow insert. 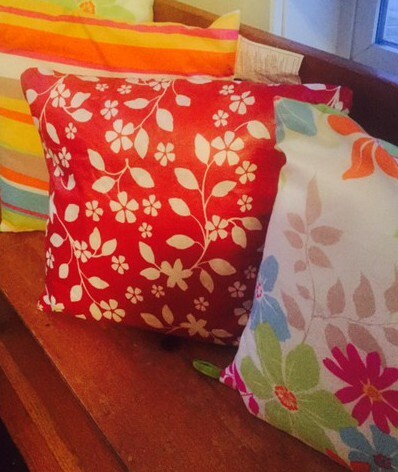 Cute, simple, inexpensive, easy DIY outdoor pillows made from flannel backed vinyl tablecloth is A Wandaful Thing! This entry was posted in Decorate, DIY, Make and tagged Crafts, creativity, Decorate, DIY, easy, ideas, inexpensive, repurpose, simple, vinyl. Bookmark the permalink. What a great idea. Love the punch of red.